Custom Client Guide — LOWCOUNTRY PAPER CO.
We specialize in custom wedding invitations. What does this mean exactly? It means we love paper, particularly wedding paper. From save the dates to one-of-a-kind monograms, we help you create a suite that embodies not only your wedding but the love you have for one another. We don’t believe that one design fits every client, so when we say “custom” we really mean it. Our designs are tailored to you – because your invitations should be as unique as your wedding day. er for your wedding paper needs. Every custom experience begins with a conversation - in person, over the phone or Google Hangout / Skype / FaceTime. After the initial consultation, we’ll follow these easy steps until we’re finished! A detailed proposal with an estimate of charges and contract arrive to your inbox. Our proposals are written a la carte style so it is easy for you to determine the best option for your budget. Once you have chosen the items from the proposal to include in your invoice, we’ll send and invoice via email for the non-refundable 50% deposit. Our invoices are sent via QuickBooks and payments are processed online via the link in the email. We use Basecamp to manage your project from start to finish, but don’t worry - everything happens via email. You will be able to login to your Client Portal via a unique website and 4-digit PIN to view all communication with us throughout the process rather than digging through your inbox. Your initial design proof arrives via email 7-10 business days after the contract is signed and payment of the deposit. All proofs are sent electronically in .pdf format. 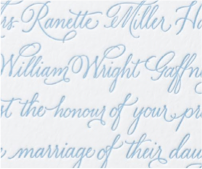 For wedding invitations, we’ll finalize your invitation design before moving on to create the full suite. Before going to print, we’ll send a request for final approval to get the “all clear” from you that all names, locations, dates, times, etc. are correct. You’ll also receive your final payment invoice showing the remaining balance due. Once the final proof is approved and invoice is paid, your designs move into production. Changes requested after your designs move into production cannot be guaranteed and may result in a re-printing costs. Production turnaround depends on the print method. Digital printing takes 1 - 2 week and screen printing, letterpress, and foil take 3-4 weeks. Don’t forget to allow time to address your invitations! Calligraphy takes time - 1 week for 50 envelopes - but don’t worry, we’ll discuss this during the initial consultation. Once you receive your invitations, take a complete suite to your local post office to have them weighed and measured to obtain the correct postage. Most wedding invitations suites require more than just one Forever stamp, so it’s important to confirm the amount of postage required to get these to your guests. Don’t forget a stamp for your RSVP envelopes as well! While each project is different, we recommend the following timeline for our custom clients. When selecting your suite pieces, consider what information you need to share with guests. Do you need a custom map? What about a welcome party invitation? The following pages demonstrate the most popular combinations, but feel free to mix and match to fit your specific needs. Our design team will walk you through the available options during your initial consultation. You want just what you need - no extra frills required! When you want all the pretties - don’t worry we do too! We are uncompromising when it comes to quality. We can’t help it. Because of this our printing partners are the best in the nation and we proudly print everything right here in the USA. A flat printing method allowing for unlimited color choices and large washes of color on white or light colored paper. Letterpress printing is a 550 year old process of printmaking that yields remarkable type and image results. A labor intensive process that involves a cast iron machine that literally presses your design into paper. It’s pretty rad! Foil printing is done on a letterpress with a heating element, which transfers the foil to your paper. Foil is great for covering dark papers with light foil colors. It also adds some amazing shines and shimmers. We’re huge fans! Since our work is all custom and each client project is dierent, our pricing is based on your specific paper needs. I know, I know, you just want to find out something rather than nothing at all, so we’ve put together some starting prices below based on the different print methods we offer. You will receive your own custom proposal following our initial consultation based on exactly what you want and how many pieces you need.